Donations will be accepted until September 1st. Everyday through his hard work Kim Jongdae inspires us with his voice; he is always there but we can't be there for him in return. As international fans, there usually isn't much we can do show our presence and support hence the start of this simple yet meaningful project. Knowing how kind he is I know that he would be extremely happy to know that his fans have managed to raise money in his name for a good cause. Besides celebrating his birthday, this money will help thousands of people in Africa live better and healthier lives. All donations will be made in the name of Kim Jongdae/The international EXO community. A certificate will be sent to Jongdae himself if the $1,000 mark is reached. Please help us raise money for clean water in Africa in celebration for Kim Jongdae's upcoming birthday on September 21st. Remember that every dollar counts! 한국의 늘 열심히 노력하는 김종대의 목소리는 우리들에게 깊은 영감을 주고 있습니다. 그는 이렇게 우리들에게 많은 것을 주지만 우리는 돌려줄 것이 별로 없어요. 해외 팬으로서 지원할 수 있는 것도, 우리들의 존재를 알릴 수 있는 길도 많지 않아요. 그래서 이런 작지만 뜻깊은 프로젝트가 시작되었습니다. 그가 친절한 사람이라는 것을 알기에 그가 또한 어려운 이들을 돕는 이 프로젝트를 무척 좋아하고 우리들을 자랑스러워할 것이라 생각합니다. 그의 생일을 축하하고 기념하기 위해 계획된 이 프로젝트는 아프리카의 많은 사람들에게 더 건강하고 좋은 삶을 선물할 것을 자신합니다. 모금된 모든 것은 김종대와 EXO 비공식 해외 팬 모임 이름으로 전해질 것이며 목표액이 달성되면 김종대에게 인증서가 보내질 것입니다. 아프리카 어딘가에 깨끗한 물을 전하기 위해 오는 9월 21일, 그의 생일을 기념할 이 프로젝트에 많은 참여와 모금을 부탁 드립니다. 잊지 마세요,아주 작은 도움도 큰 힘이 된다는 것을!! REMEMBER TO LEAVE YOUR MESSAGE TO CHEN If you need more space visit the link above If your name is wrong etc again, visit the link above and send an ask all messages max 200 words long. 08/16/14 Anonymous $23.00 Happy Birthday Chen! I hope this not only makes you feel happy but also all the people that will be benefited by it! 08/14/14 Anonymous $23.00 Happy Birthday Chen! Thank you for everything you do! 08/13/14 Anonymous $25.00 Chen oppa, fighting! 08/12/14 Anonymous $23.00 Happy birthday! Your dancing is the best! kekeke Thank you for being in EXO. To have met you is a blessing. I'm proud to be your fan and a fan of EXO. Saranghae! 08/11/14 Anonymous $10.00 Happy Birthday! ! Thank you Chen, we love you! 08/09/14 Anonymous $23.00 To my beloved chen oppa, have a happy birthday this year! 08/06/14 Maryvic Salcedo $23.00 Happy birthday Jongdae! I wish you all the happiness in the world. Keep shining with your beautiful voice. 08/06/14 Anonymous $10.00 Jongdae: your voice, jokes, and kindness inspire so many people. Please rest when you can and stay healthy! I wish you the best of luck on your birthday, and every day after! 08/05/14 Pernille Lindenskov $13.00 Happy Birthday Jongdae! I hope you're having a good day! Lots of love from Denmark. 08/05/14 Sarah Teo $23.00 Happy birthday jongdae! I hope your birthday this year would be meaningful because of this project! 07/30/14 Anonymous $23.00 Thank you so much for all you have done for us fans. I wish I could do more to show how much I admire every ounce of your effort and hard work. Please take care of yourself and stay healthy!  ! 07/29/14 Anonymous $23.00 Happy birthday Jongdae! I hope this water brings happiness to someone's life just like you have brought happiness to our lives. 07/28/14 Emily Ridgway $23.00 Happy Birthday Jongdae! I hope you're day is filled with happiness and laughter. Live well and stay strong! 07/28/14 Anonymous $75.00 Wishing you the very best, happy birthday Kim Jongdae! Chen fighting! EXO fighting! 07/18/14 Anonymous $23.00 Happy birthday from Finland! Chen, you are our inspiration. Thanks to you we decided to donate. Please continue to inspire us. We love you. 07/18/14 Karen Huang $50.00 Jongdae happy birthday from Australia! This is such a fantastic idea, Pary thank you so much for organising this! 07/18/14 Anonymous $15.00 Have a wonderful birthday, Chen. We love you! 07/17/14 Anonymous $46.00 wishing the best to chen and those who will share this water! 07/15/14 Helene Holstad $25.00 Lots of love from Norway! 07/12/14 Huong Le $15.00 Chen !!! Hope you have a wonderful year. Chen ! 07/11/14 Anonymous $23.00 Happy Birthday Chen! I hope that this water brings happiness to whoever tastes it! 07/11/14 Anonymous $15.00 Words cannot explain how happy your voice makes me every day listening to EXO-M at my boring job. I am so proud of you and keep up with the good work learning Chinese! I'm so proud of you. 07/10/14 Anonymous $46.00 ~! ~ EXO ~! 07/09/14 Anonymous $10.00  ! EXO let's love! Happy birthday Chen! 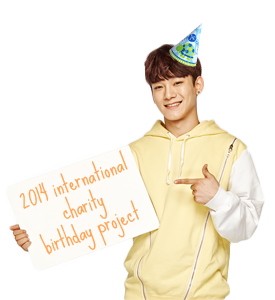 07/09/14 Anonymous $23.00 Happy birthday Kim Jongdae! 07/08/14 Kimberly Edmunds $60.00 Happy birthday, Jongdae. You inspire us to chase our dreams--here's hoping this project gives others the same chance! 07/08/14 Connie Lu $23.00 To our handsome angel, Kim Jongdae. Thank you for all your hard work and love! Yours, always EXO saranghaja! 07/08/14 A Fengurl $46.00 !! ~ !! We are so proud of you and will support you until the end, bb ! 07/08/14 Jerlin Quah $10.00 Happy Birthday funky funky chen chen! 07/07/14 Kristyn H $15.00 Happy birthday Captain Beagle! You deserve the world and more. 07/07/14 Gabrielle Tetreault $15.00 Jongdae fans unite! 07/07/14 Sophie O. $23.00 I hope this project will bring as much happiness to others as you have given to us. Happy birthday Kim Jongdae! 07/07/14 Courtney Birdwell $10.00 while it's not much, I wanted to contribute. You bring joy to so many Jongdae, so here is our way of bringing joy to you and others. Have an amazing brithday! !! !! 07/07/14 Nikki S. $10.00 Thank you for always making us happy! 07/07/14 Audrey Monteil $75.00 Thank you for all of the fan who are donating~ Let's make it ! FIGHTING! 07/07/14 Abigail Diaz $25.00 For always making myself and my fellow s smile. I hope that this will be able to bring smiles to even more people in this world. Thank you for everything. Happy birthday! 07/07/14 Michelle Kim $20.00 For always making us happy, I only wish for your happiness. Thank you so much, Kim Jongdae. Words can't explain how much you mean to so many. 07/07/14 Melida Ortez $10.00 I'm poor atm, but this is for a wonderful cause b/c of an amazing person and beautiful people making this possible! 07/07/14 Michelle Thorn $20.00 ! ! 07/07/14 Kayla Sianis $10.00 EXO fighting^^ We are One! 07/05/14 Anonymous Donor $115.00 Believe that there's an angel here on earth, and his name is Kim Jongdae. 07/05/14 Anonymous Donor $46.00 !! 07/05/14 Anonymous Donor $10.00 Happy Birthday! Let's get this project going!